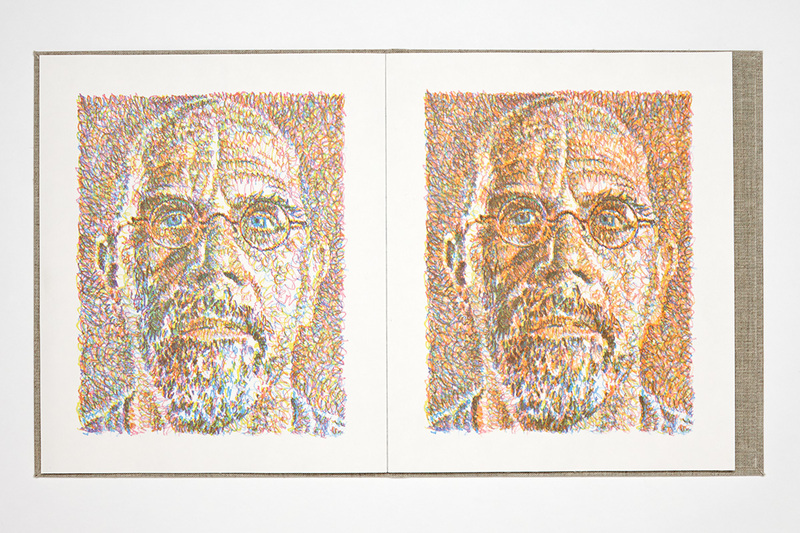 The idea of a book without words had resonance for Chuck Close. As a child, his severe dyslexia stood in the way of reading, making images all the more important. He remembers a visual encyclopedia from his early years and the feeling of being overtaken by the intensity of its pictures. 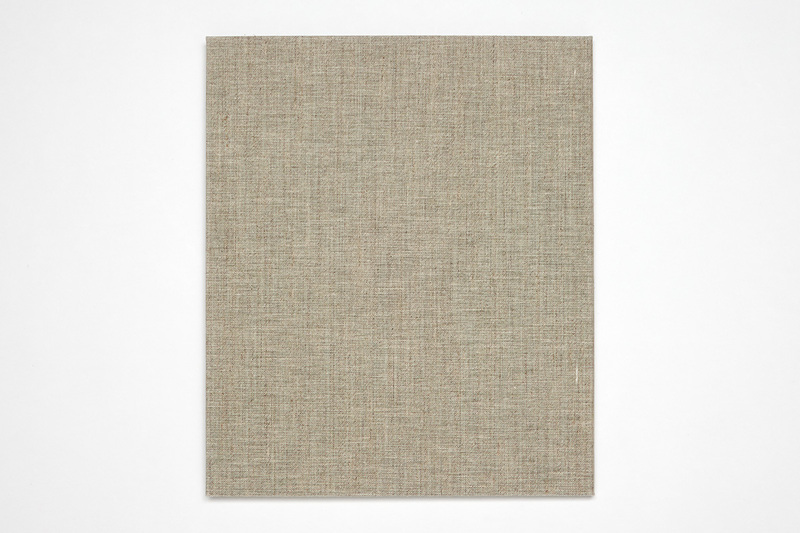 The idea also resonated with his ongoing interest in revealing the process of his work, which he accomplishes largely through visual presentation, using very few words, if any. 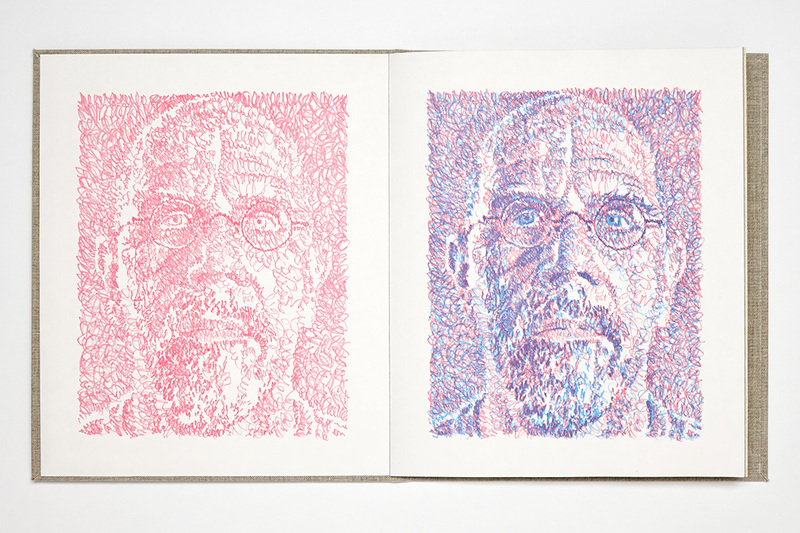 Scribble Book is a self-portrait that emerges step-by-step out of the printing process, one plate and one color at a time. The viewer follows a series of nine individual plate proofs (volume 1) along with a corresponding series of nine progressive proofs (volume 2). 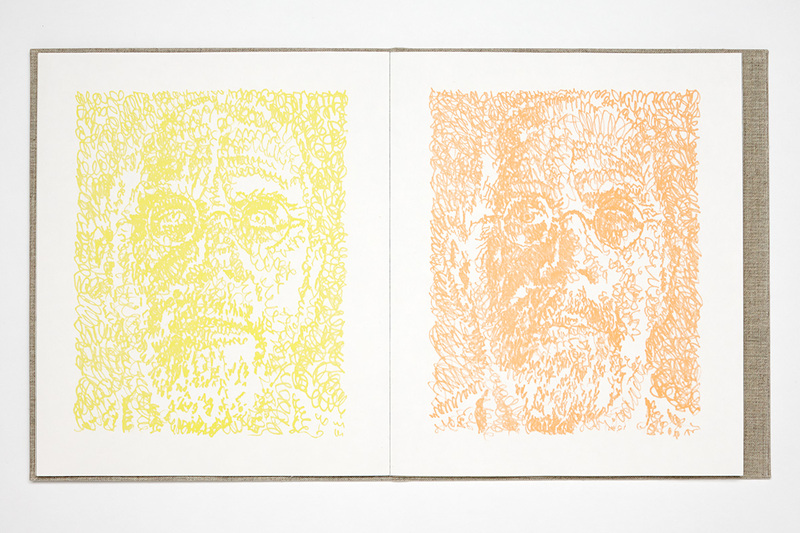 By comparing the plate proofs against the progressives, the viewer may ascertain not only the effect as one color is added to another to create the final nine-color portrait, but also the compositional decisions and careful modifications made by the artist at each stage of the project. 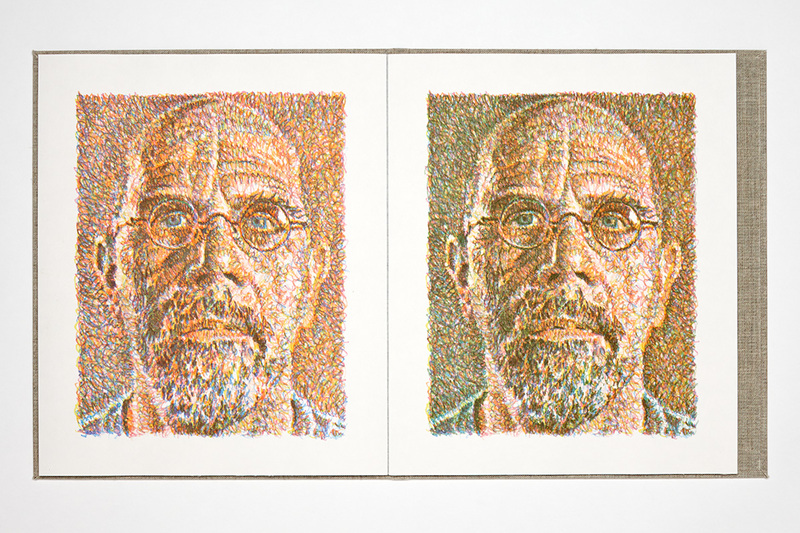 A similar work was made with twelve plates and included in the exhibition Chuck Close Prints: Process and Collaboration at the Metropolitan Museum of Art in 2004. It was an immediate success. 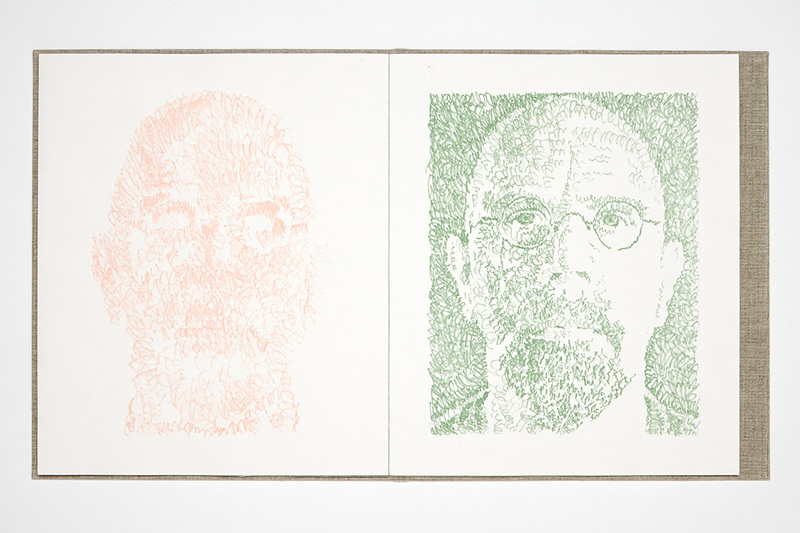 However, Close became fully aware of the effectiveness of the work only by means of an error: two of the prints were hung out of sequence, a circumstance that evaded the notice of both Close and the museum staff. It was not long before representatives of the museum received letters from two visitors who had noticed the error. 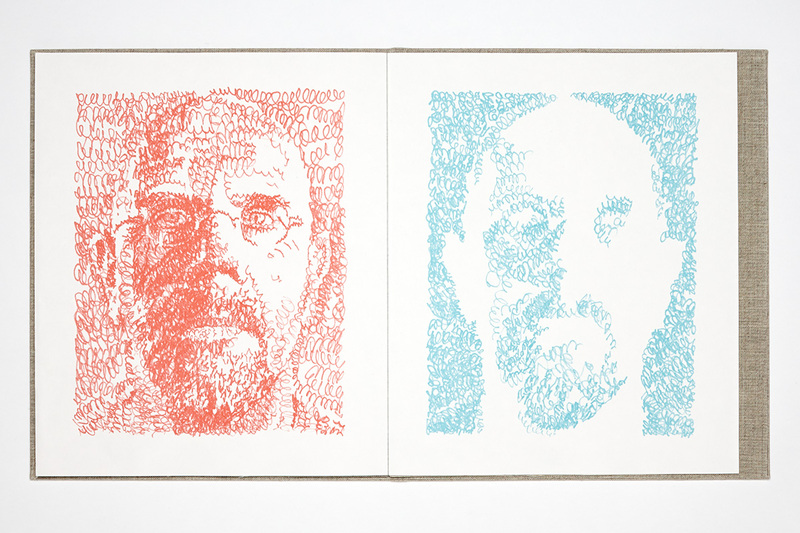 “And just imagine,” Close relates, “if two people took the time to write letters, how many more must have figured it out and not bothered to write in!” Careful viewing was all that was needed, and the work inspired just that. 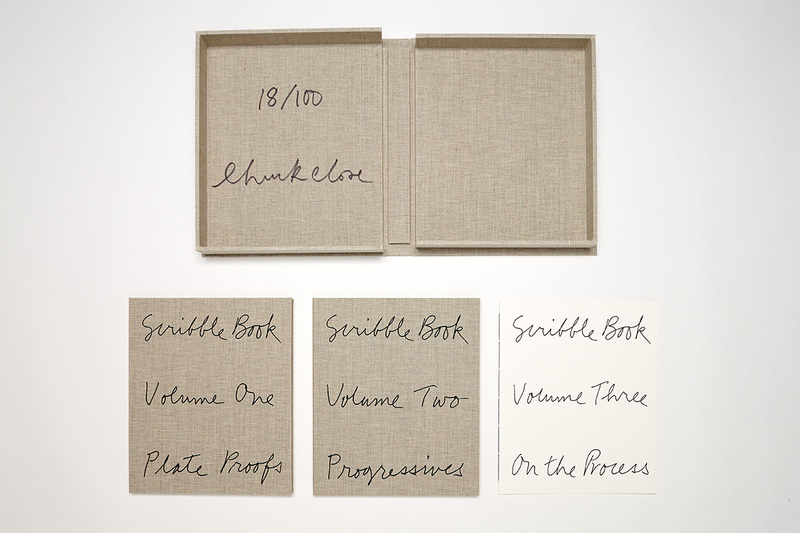 Scribble Book is presented in this Little Steidl edition as two accordion-fold books. 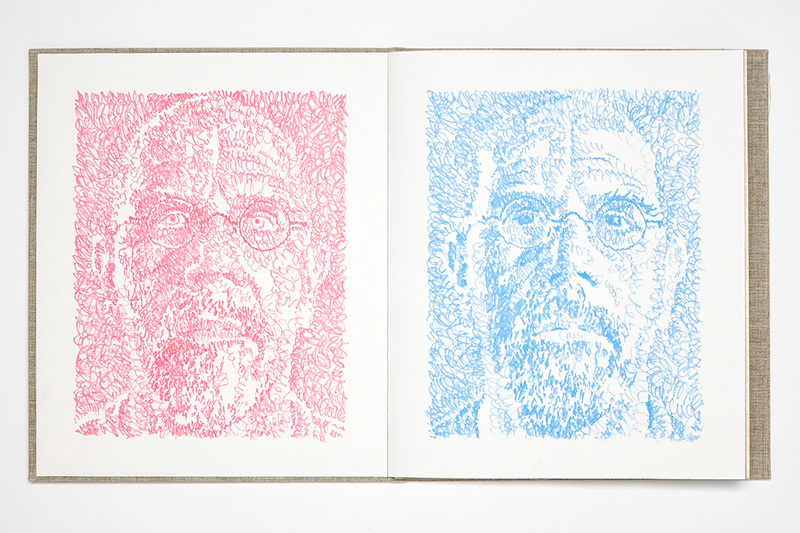 The first shows the series of plate proofs, and the second the series of progressive proofs, culminating with a 9-color self-portrait. 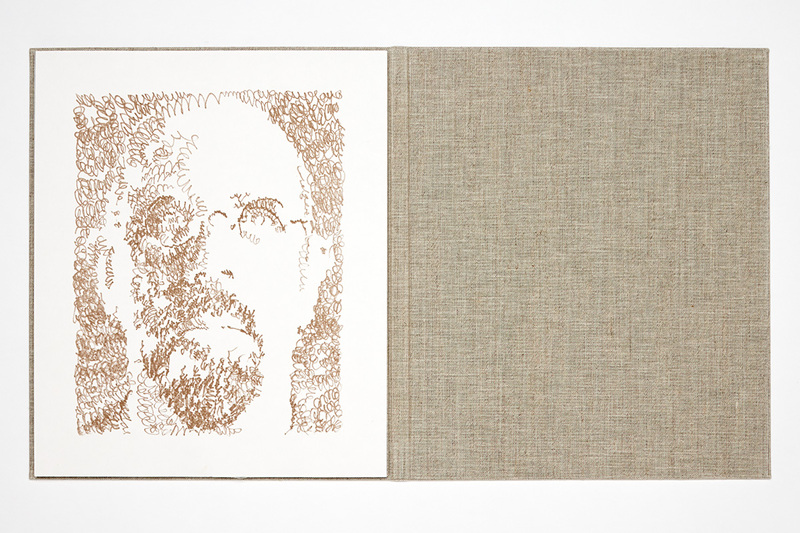 For those seeking a more detailed understanding of the process, these books are accompanied by a separate text in which the artist gives a personal account of his drawing process as recorded through printmaking. 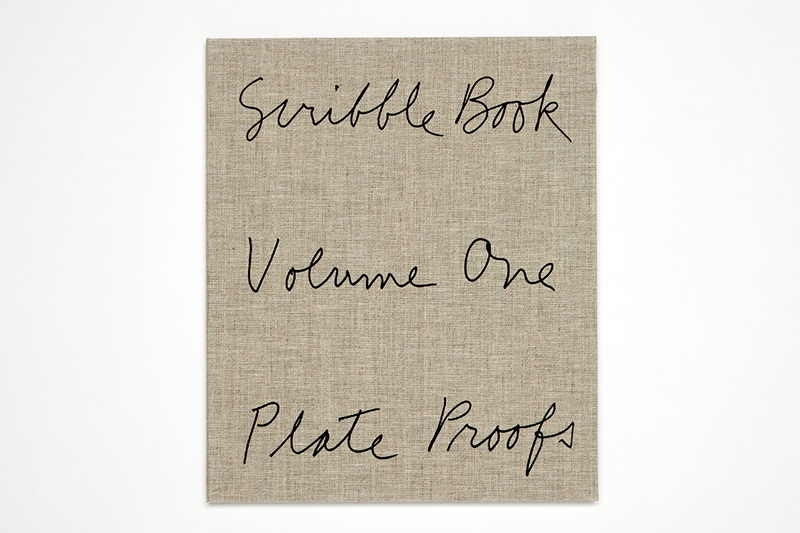 There are two editions of the Scribble Book: a trade edition and a “limited edition”. In this case, we must clarify that both are limited and hand-bound editions. 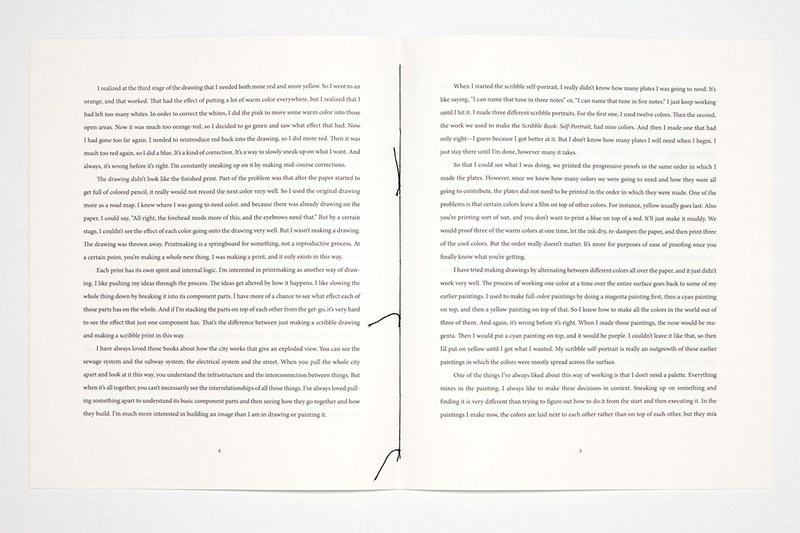 The intensive printing process that produced this work could not be repeated. And the accordion construction on this scale necessitates a hand binding process in any case. 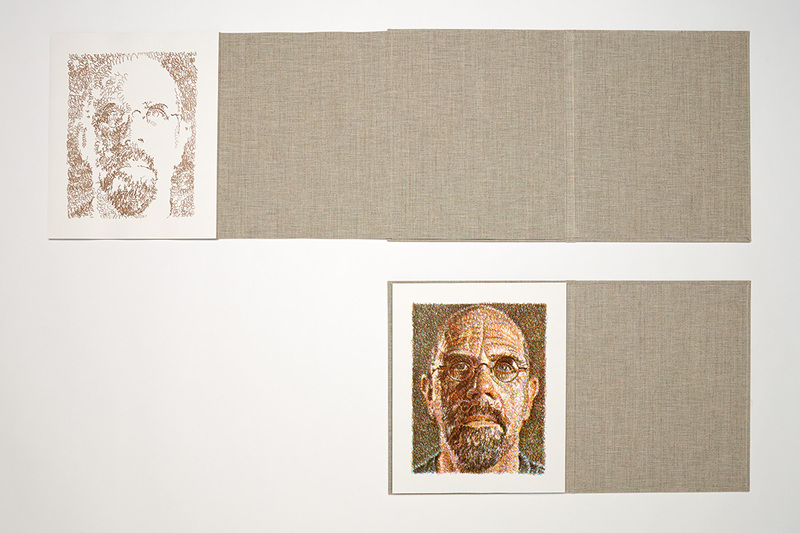 The “limited edition” follows a construction method used by Chuck Close for other process works produced as limited editions: an accordion is achieved by mounting individual, trimmed pages on a continuous strip of linen. In this way, only the linen on which the sheets are mounted is folded, not the paper itself. The method was developed with Stuart Einhorn at Portfolio Box in Rhode Island, and it is indeed a precise and labor-intensive binding method. 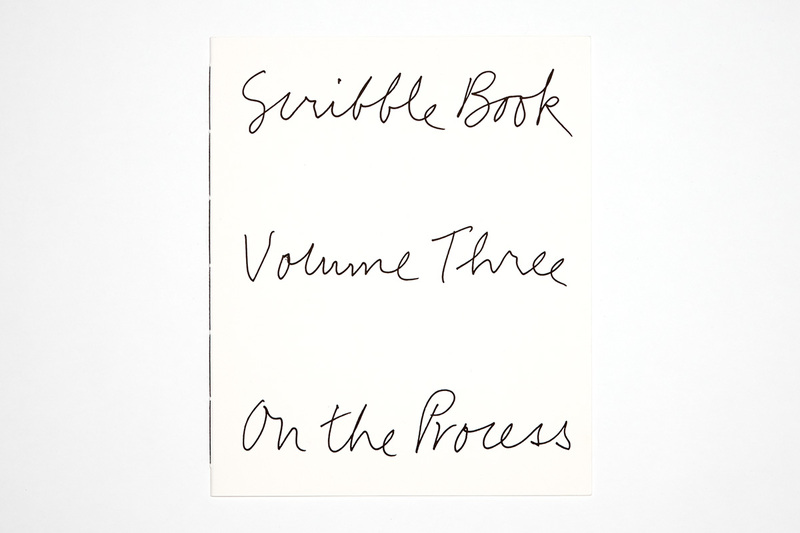 After spending time in the studio, it became clear that the binding was a critical part of the history of these process works, and we wanted to realize at least a few copies of Scribble Book through this method. We were relatively ambitious with an edition of 100 copies, 10APs and a couple of HCs, but Stuart Einhorn pulled it off. In addition to the linen-backed accordion folds, the cases of volumes 1 and 2 are wrapped in linen. 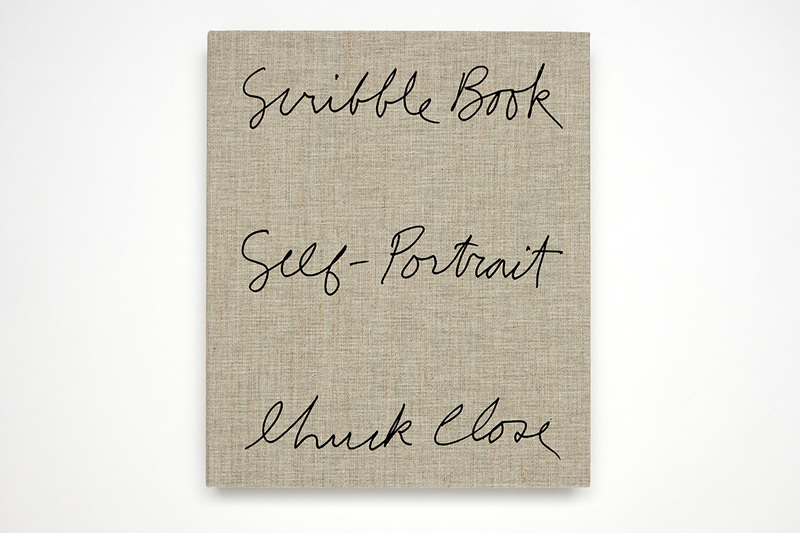 All three volumes are housed in a linen-wrapped, clamshell box that is signed and numbered on the inside by Chuck Close. Three volumes in a clamshell box: two hand-bound, linen-wrapped hardcovers, each with a 9-page accordion mounted on a continuous strip of linen; one stitched softcover booklet; linen-wrapped, clamshell box. The covers of the box and volumes 1-2 are silkscreened. Paper: Hahnemühle Natural Line Velin 170g, an acid-free, naturally sized, alkaline buffered paper that meets the highest permanency standards under ANSI Z 39.48-1992, DIN ISO 9706, and DIN 6738. Boards are acid-free, high-density bookbinder’s boards. 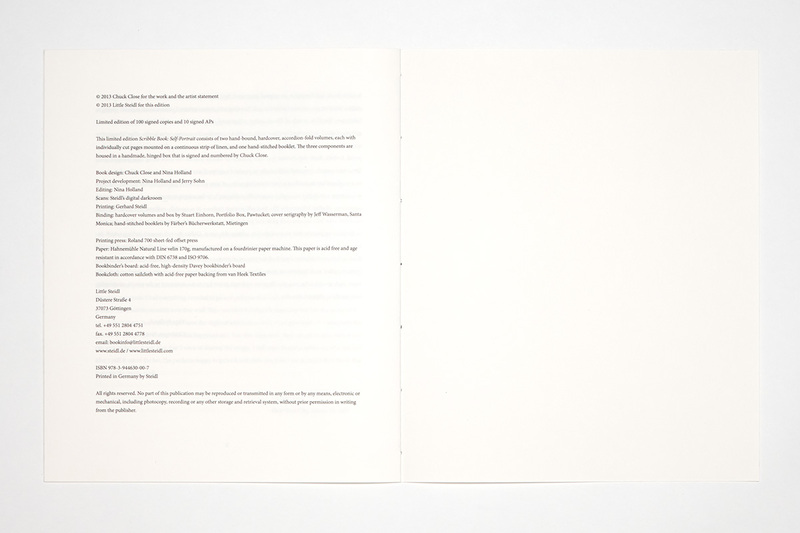 Printing: this original work for the offset-lithographic medium was printed with nine inks on Steidl’s Roland 700 press. 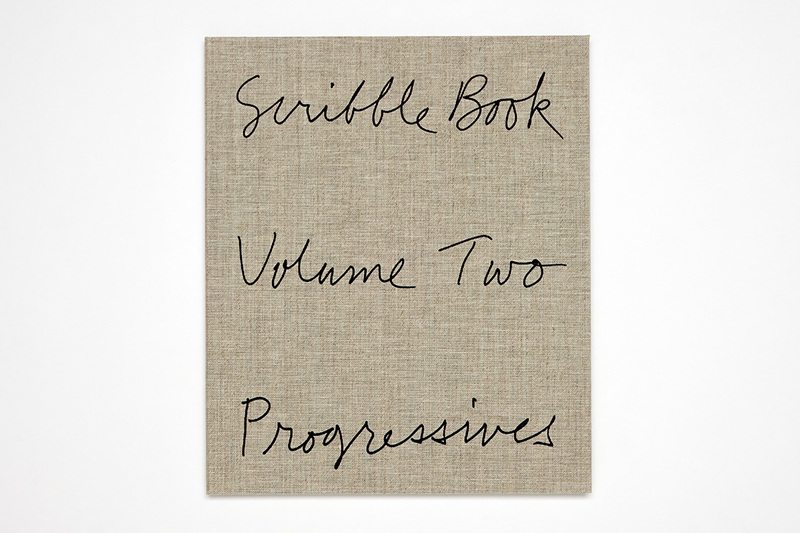 The linen covers were silkscreened by Jeff Wasserman in Santa Monica, California. 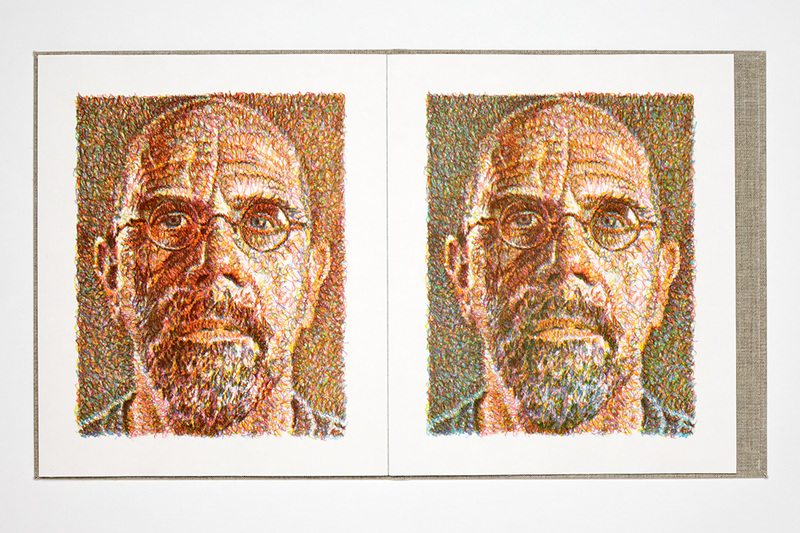 Chuck Close was born in Monroe, Washington in 1940 and pursued his education in visual art at Yale University. Photography has been an integral part of his painting process since the mid-1960s and later grew into a body of work in its own right that includes large-format Polaroids and daguerreotypes. Close has also distinguished himself as a master in the area of printmaking. 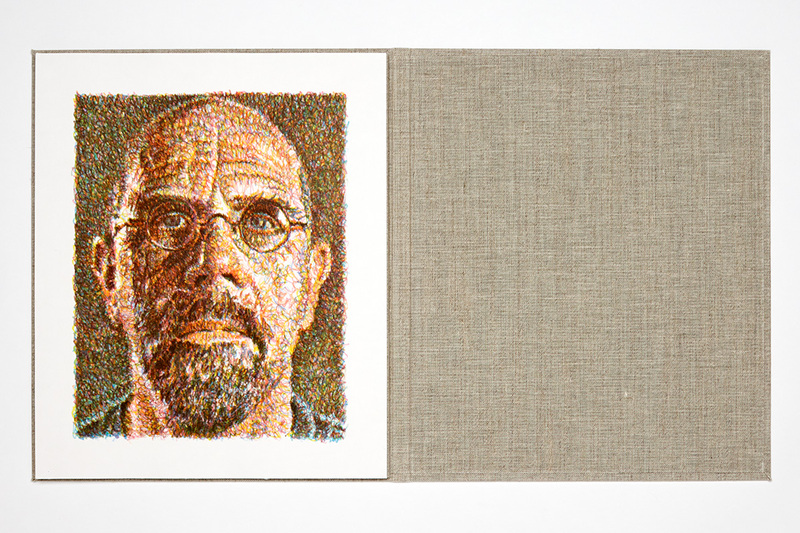 Since 1967 his work has been the subject of more than 100 major exhibitions throughout the world.